We had a lazy kind of the day a couple of weeks ago and were not really in the mood to go shopping, especially since we were due our weekend grocery shopping the next day. So, we had to eat, but no fresh meat, lots of Bacon though – we always have Bacon and this Bacon Butternut and Sweet Potato Casserole was made in a jiffy. A bit of peeling, chopping and dumping most of the ingredients into the oven dish and into the oven. Whilst the casserole was doing it’s thing in the oven, I whipped up a coleslaw and some slices of papaya to serve along with the casserole. 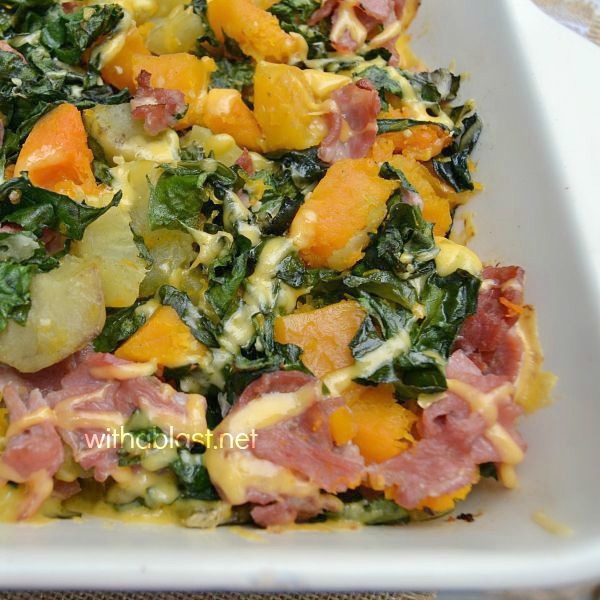 In between I added the Spinach and Bacon to the casserole, which took me about 3 minutes. You can sprinkle the Cheese over at this point as well. But I like my cheese to only melt and not bake to a crisp, if you know what I mean. Fortunately we still had some fresh, crusty dinner rolls left and that completed our dinner. Quick, easy and delicious, just the way I prefer making dinner and healthy as well ! Now, do not let the ingredients throw you, this is a very filling dinner by itself for 4 adults, add the salad, fruit and rolls and I easily stretched the casserole to feed 6 hungry adult mouths. You can definitely taste each ingredient with only a tiny hint of sweetness from the Butternut and the Sweet Potatoes. All in all, this is a winning flavor combination which I made again for lunch. But I halved the recipe as it was only hubby and myself home for lunch and we had some leftover carrot-pineapple salad with the casserole this time round. Leave out the Bacon and voila ! 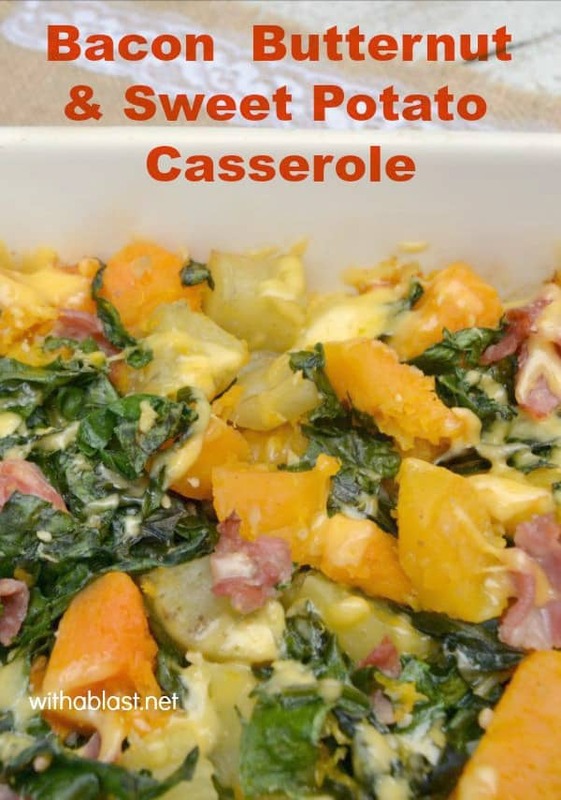 you have one tasty side dish to serve with any meat, or take it along to a family gathering. Serve with a side salad or two and a crusty dinner roll.